It’s a dream come true for fans of 30 Seconds To Mars!! That’s right, the band that brought you “The Kill,” have returned after a 5-year break of no music with not just an all new album, but a huge North American tour to accompany it!! They’re supported on the tour by Walk The Moon, MisterWives and Joywave – it’s a truly epic line-up!! Coming to the Xfinity Theatre on Saturday 9th June 2018 – don’t miss out!! Grab your tickets today while they last!! The upcoming album is the 5th by Jared Leto’s alt-rock band, and it promises to follow in their trend of not sticking to one musical convention. “I think our last album was maybe a bridge between where we were and where we are now and it’s a very, very different album,” Jared Leto said, but laughed off the idea that his recent role as The Joker in Suicide Squad would have any influence on the album. “I think I’ve had enough dark and twisted with 30 Seconds To Mars over the years…I don’t need any Joker input, we’ve gone through our dark, twisted period. We’re more in our aspirational, self-reflective period or something.” All the accompanying touring acts have got fresh new releases out too – it’s going to be an evening full of brand new songs!! 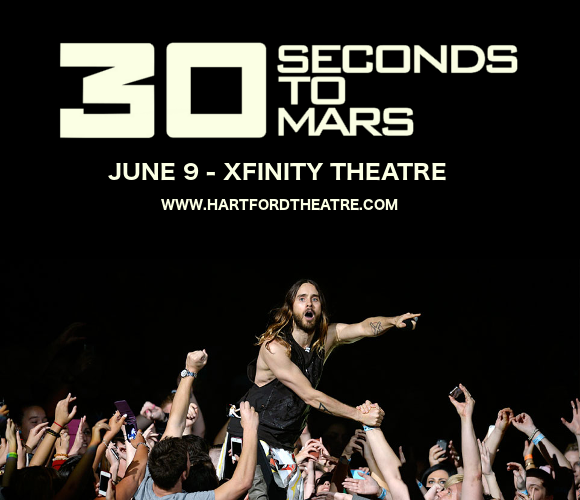 Be among the very first to see all the new material performed live in front of your eyes – grab your tickets to see 30 Seconds To Mars NOW while you can! !